Sunday was a day of abundance for USK Seattle at the Ballard Fishermen's Terminal! We had sunshine, blue skies, subject material at every turn and scads of sketchers from all points north, south, east and west! At one point there were approximately 38 sketchers who shared their sketchbooks, celebrating the 7th anniversary of urban sketchers. Scroll down to see the day's previous blogposts by my fellow correspondents. There's a cement deer on top of those blue sheds! My sketch of the yellow Beach Gang shed under the bridge..
With such an exciting profusion of subject material available, it's almost like trying to read a 30 page menu-what should I paint? and where do I even start? It helps to have been there before. 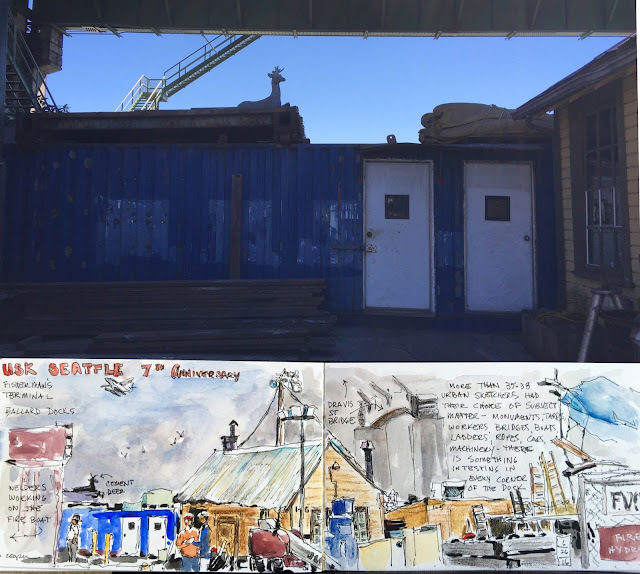 This will be the third time that I have visited Fishermen's Terminal in Ballard with the Seattle Urban Sketchers. My first decision today was to eliminate repeating any subjects I've sketched before, such as the Fishermen's Monument and the Qingdao Eagle. See previous sketches here and here. When you're out there sketching, you start really noticing things, including a bright yellow Corvette, seaplanes flying overhead, ladders everywhere and a cement deer. Although I asked one of the men standing under the Ballard bridge nearby, I couldn't get the story on it. Even though it was apparent that the fellow was also seeing it for the first time, he acted like a cement deer on top of a shed wasn't that much out of the ordinary. I only discovered it myself as I was sketching the "Beach Gang" shed nearby. This time it truly was "seeing my world one drawing at a time." 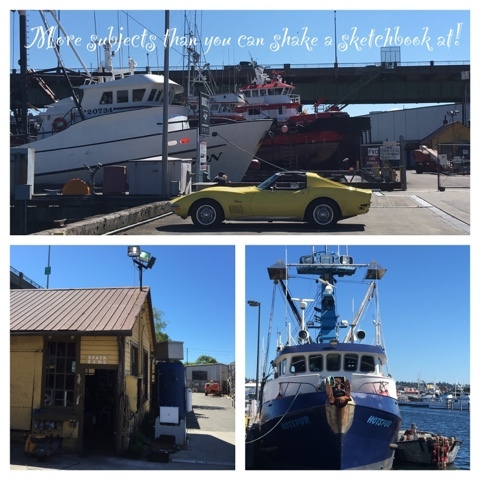 So much to see and sketch, indeed! Yet I missed the cement deer!